Anyone with information on the whereabouts of Jordan Belliveau is asked to call the Largo Police Department at 727-587-6730 or 911. LARGO, Fla. – A Largo Police Department spokesperson said investigators are searching two specific areas for the last known location of a missing 2-year-old boy Monday. The Florida Department of Law Enforcement issued an Amber Alert for Jordan Belliveau on Sunday morning. Investigators are searching the area near Belliveau’s mother’s apartment at 3660 East Bay Drive in Largo. Police said Belliveau and his mother were walking on East Bay Drive near Belcher Road to a friend's place around 9:30 p.m. Saturday when they were offered a ride by a person they didn't know. The person said his name was Antwan. The mother told police that once they were in the white Toyota Camry, she was struck on the face and lost consciousness, police said. When she woke up, it was about 1:30 a.m. Sunday and she was in a wooded area in Largo Central Park without the child. Investigators searched the area but Belliveau was not found. Surveillance video confirmed the mother's location when she walked to Largo Central Park. She needed medical help and was sent to be treated at Bayfront Hospital. The mother told investigators she got into the car because Belliveau was too heavy to carry to their destination. Slaughter said that Belliveau's mother did not know the suspect. On Monday, police released a sketch of the suspect. He is described as a man who appeared to be around 26 years old. He's black and identified himself as 'Antwan.' He has gold teeth and dreadlocks. He was wearing black basketball shorts and a white tank top. Police are asking residents along East Bay Dr. corridor between Belcher Rd. and Missouri Ave. for any surveillance video that might have captured the suspect between 9:30 p.m. Saturday and 1:30 a.m. Sunday. “We have the Pinellas County Sheriff’s Office dive team out looking through that pond for us just to make sure there’s nothing suspicious in that pond, or anything that may help us find him,” said Largo police spokesperson Stephen Slaughter. “We’re going to do the same thing through different waterways down the way. #MISSING: Jordan Belliveau, 2, last seen Sat. evening walking w/ mother on East Bay Drive near Belcher Rd. Largo police said the mother is being cooperative with the investigation. Slaughter said investigators are using a dive team and K-9s to search two areas where the mother said was Belliveau was last seen. Earlier Monday, Largo police released a picture of the 2010 White Toyota Camry that Belliveau could be traveling in with a man named Antwan. 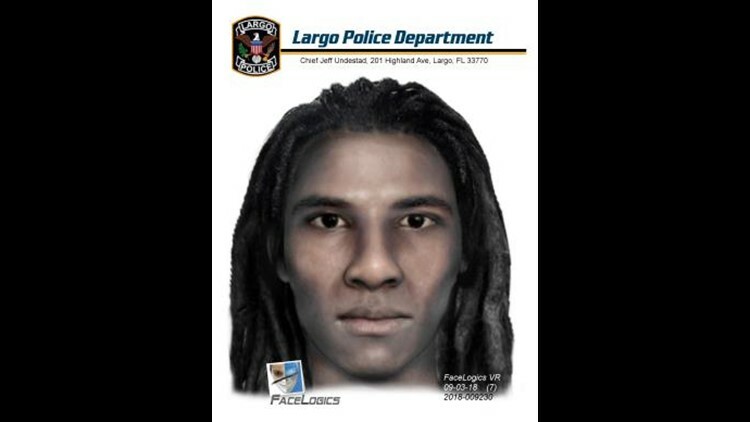 The suspected Camry has a white grill and dark-tinted windows, Largo police said. Investigators believe the Camry could have rosary beads hanging from the rearview mirror and a black ice air freshener. Slaughter said safe places include local fire stations or even a library. Anyone with information on the whereabouts of the child is asked to call the Largo Police Department at 727-587-6730 or 911.